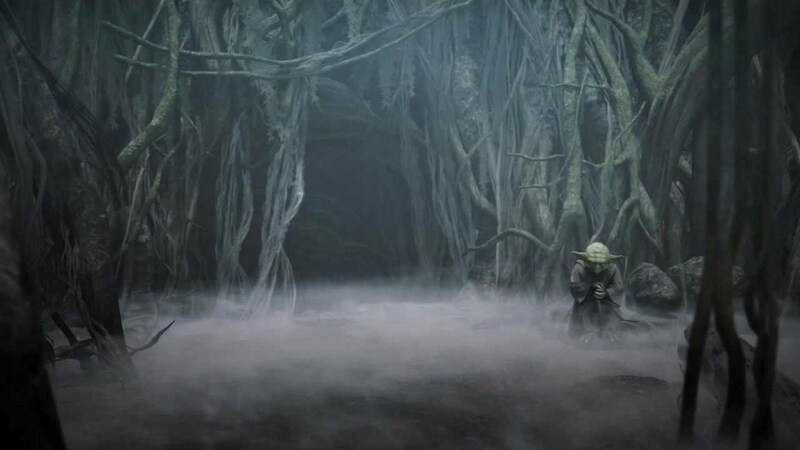 Alone on Dagobah sat a quiet little cave, the location was not easy to get to, nor was it accommodating, however inside was the source of learning that Jedi travel to. The look is non-descript as it is always changing, not to mention the eery feeling around it. The only thing that is unmistakable is the overpowering feeling of the Force, the Dark side is strong inside of it. It is not impossible to exit the cave alive, which is why it has not been closed up by now, but it is still something to which most, if not all must pay the closest of attention to. The small sentient sitting off to the side? No, he is not "Yallayo". OOC: I didn't even realize this was here...my apologies. Jacob Jr steadily walked through the dense terrain of Dagobah. What seemed like weeks he stayed here. Although it had only been one more or less. His transport had left and would come back when he had retrieved what he was sent here to get. As the older Padawan walked up to the cave he looked at what seemed to be a small sentient being standing there. A very short green sentient being and he raised his eyebrow. Silver lightsaber hung from his belt as he brushed dirt off his hands onto his tan colored pants and fanned himself with his green shirt. It was humid in these parts and the swamp had it's own temperature which was hot and sticky. Not saying that he was miserable here but he'd found a cave nearby to sleep in. Although there was a presence there but nothing of the Dark Side. Junior then walked to the cave as the being looked at him and he looked at it. He still couldn't tell who it was although he could pretty much see through this individual. Was he a ghost? Some kind of apparition of sorts? Honestly Jacob thought that it was a Force ghost of a Jedi or some other Force user but he then walked up to the entrance to the cave. Although he couldn't see anything within it he then looked to the small sentient again who then looked down at the ground then back up at him. Breathing in and out he then brought the Force to him and felt the warmth of the Light Side of the Force. His blue eyes then looked once more at the entrance way and he almost stepped in when he heard a voice. Inside the cave the Dark Side is...and visions you shall see... The voice said to him and he then looked as it seemed to come from the Force. Jacob then looked around and noticed that the small sentient creature had vanished. So he was indeed a Force ghost. Not that he was afraid but now he realized what he was in for. Noting that the cave seemed to radiate dark power he then swallowed hard and stepped inside. Holding his hand onto his lightsaber hilt just in case. Which he was grateful that his father had left the silver crystal for him. It was a polar opposite color to the one that he knew his father had. Walking into the cave he then squinted to adjust his eyes to the near pitch black of the darkness inside the cave. In the first "room", Jacob would see a little boy with brown hair, wearing dirty jedi clothes. He is crying, they are tears of fear, he is lost, or at least appears to be. Either way, he saw Junior a few steps in. "Please, don't hurt me." The voice sounded familiar. It was his own as a young boy. Jacob looked and heard the sound of crying. Canting his head for a moment he then stepped further inside and walked softly as his feet would take him. Looking around he didn't see much at first and his eyes finally adjusted to the darkness that was the cave within. When he got further in he saw the little boy dressed in dirty Jedi clothes. It was odd to him and he then saw the brown hair and the similar features of his own. When Jacob got closer to him to see him better he then heard the child say not to hurt him. Holding his hands up Jacob then tried to reassure him. He just didn't notice it was actually him. "I'm not gonna hurt you. Are you lost in here?" Jacob then said until he could fully see that it was him as a little boy. Blinking his blue eyes the Padawan was slightly confused. He heard what the little sentient said but if this was the darkness trying to trick him he wasn't having any of it. Junior would stand firm in his belief of being a Jedi. That he shouldn't be afraid of the darkness. Not that he had any fear at this moment. All he had was more confusion then anything. Why was it showing him a vision or whatnot of himself? At the moment Jacob was looking at himself as a little boy and he remembered at times he was afraid. But he knew that he had courage to face the fear of whatever it was. In those times he had his father and his father was his hero. So, like his father he wasn't gonna be afraid. "I can help you, Jacob." He said to the boy version of himself, "I'm right here. I can lead the way out of here. Do you know of an item in this cave? A holocron perhaps?" Jedi Master Tessa Rendahl arrived on Dagobah, seeking out Jedi Master Caltin Vanagor. She had an urgent message for him that would require him to leave the planet immediately. Upon locating him, she delivered the message to him and nodded as he quickly departed. Turning her attention to Jacob Murano, Jr. she gave the traditional Jedi bow in greeting. "Greetings Padawan Jacob Murano, Jr. Jedi Master Vanagor had an emergency to attend to and has left the planet. I will be stepping in and continuing this trial." The padawan's attention was directed back to the first room where a small item began to glow in the room. The young boy took a step back and pointed off to the side. The little boy version of himself then blinked stopping his crying as he looked around the cave then back at Junior, "I don't know how to get out. I got lost from my dad. Your...a Jedi aren't you? My dad is a Jedi." Junior didn't wanna burst the kid's bubble, but then again it was just a vision from the Force. Smiling at him he then held out his hand which his younger self took and he pulled him to his feet. Holding his hand he then lead further into the cave. Looking down at the poor kid he then scanned the area with his eyes trying to figure out where this supposed holocron could be. But at that point he felt the presence of another in the Force. Not that of Caltin, but someone else. She was familiar but not well known like some of the others. Looking around he then took the younger Junior with him to the entrance. Seeing Master Rendahl he then nodded his head, "That is alright, Master." Turning his attention he felt something pulse with the Force. It wasn't strong like Master Rendahl but it was felt nonetheless. The Padawan turned his blue eyed gaze to it and saw it glowing. Canting his head he felt little Jacob pull back from him as they ventured to where they were before. Seeing little Jacob point to the far off side he then smiled and looked down at him. "Jacob, that's what I came here for. I think." He said with a calm demeanor then said and got closer to him and bent down to his level, "Nothing to be scared of. Be just like da...I mean your dad. He's brave isn't he?" Little Jacob nodded his head and smiled, "He is. Should we go closer and grab it?" "Yes but we gotta be cautious. Stick close to me, Jacob." He said with a stern voice, "I'll protect you." As they approach the holocron, they hear a faint voice from beyond. unlock the holocron when you stand still..."
Jacob heard the voice, looking up and around where he stood. Not knowing where it came from as he then heard the words that whoever it was spoke of. So he had to find a memory crystal? Shouldn't be hard...least he figured it shouldn't be. But, looking around he saw nothing with his eyes and that disappointed him. Though, if a crystal was there it wasn't glowing or anything it could be so blended into where he stood that he'd never see it with just his eyes. As Jacob kept a steady pace, slowly walking through the small archway of the cave it opened into a bigger chasm. As he looked inside this chasm he then opened himself to the Force. The holocron was now behind him not too far out of reach. It wasn't unlocked as the voice had spoken of but as long as he knew it was there that was what counted. Until he could find this crystal and as he opened himself to the Force, Junior then let it reach through him and felt the Light surround him. Even if this cave had supposed influence of the Dark Side he wasn't letting that energy touch him. He was a Jedi and he wouldn't resort now to letting darkness take hold of him. Not like it did his father. Letting the Force guide him he opened himself to it as the Light went to his eyes, so he could see what was beyond his normal sight. Jacob looked around once more seeing the colors of gray and some blue, which meant there was parts of the Light Side within the cave, as well as the neutral. Must be the Force itself not one side or another. As it was always said the Force was in all things. Something his dad even said quite a few times. Searching through the Force as his eyes scanned through the large chasm he saw something start to glow. Why he hadn't sensed it was beyond him. Maybe too much concentration of the Force in one area perhaps. Either way, Jacob then walked to it as he then started trying to pull it out of the wall. His bare hands couldn't do it sadly and he stepped back. Taking a deep breath and concentrating he then let the Force flow away from his eyes and then reached out with his hand. The Force made the crystal rock a bit inside it's resting place. Pulling it once more he then imagined his fingers grasped around it and he pulled harder. This time it then came loose and flew into his hand. Standing still as the voice told him he then saw it glow once it hit his palm. Smiling he then saw it's white glow and then felt accomplished that he could come here and do it. That the Dark Side of this cave didn't influence his actions. He felt free of it for once and in control of himself. As he heard something click he figured it was the holocron. A faint smile came to his lips as he then walked back to where the holocron was. Though as he entered he saw not the little kid version of himself anymore. No...it was his father! Standing there with his saber at his side and once he saw him ignited it as the golden blade snapped to life inside the cave. Now he was between Jacob and the holocron. A evil smile on his lips as Jacob knew this wasn't his father but a apparition of him. The Dark Side trying to play tricks on him. But, Jacob put the crystal into his pocket and made sure it was there safe. Taking his silver bladed lightsaber he then kept it at his side, ready to defend himself. "Your not my father..." Jacob said out loud, "...I would know. The Dark Side won't influence me again. Like it did him." His father then stepped forward holding his blade behind him at an angle, the opening move of Djem So with a sinister smile on his face, "Who said I'm not your father, Jacob? I'm standing right in front of you aren't I?" Once the apparition took a step forward, Jacob had no choice. He knew the next step and the apparition of his father would close the distance and attack. Junior wasn't stupid he knew what style that was. Looked it up in a holocron before he chose Ataru as his form to learn. But, Junior also knew that he had no space in here to do anything. So, at a disadvantage he would need to revert to Shii-Cho and keep to defending himself more then attacking. The Padawan knew he had the Force and was quite gifted with it and knew he had the advantage there. For how long he didn't know. "You might be, but, my father would just flat out attack me either. I know him better then that." Jacob said holding his blade out to defend himself. Then with those words said, his 'father' struck out, closing the gap. Coming in hot the apparition of Jacob's father struck toward his shoulder, then followed with a battering strike at his mid-section. Then came down to try and cleave him in two with a powerful and precise strike at him. Whatever this apparition was, it was crafty. It apparently knew some of his father's more aggressive tactics. Some he'd seen as a young boy when he saw his father teaching. But, Jacob didn't know his father knew Djem So. Whatever this thing was it knew more then he did about him. Moving out of the way of the shoulder strike he then backed up a step. Which also made the mid section strike miss but barely. Breathing a sigh of relief to himself, Junior then saw the attack coming at his head and he then raised his hand up a bit, channeling the Force, as the Light filled him and he defended himself sending the apparition toward the ground. Once more breathing a sigh of relief the Padawan then held his blade at his side. Hopefully this thing would give up. Not likely but he had to hope it would. "Give up. Your not gonna beat me. You got no influence over me. Not anymore." Jacob said standing tall and proud, the Light Side flowing through him, giving him a renewed sense of valor and confidence against anything. The apparition of his father rose back up to his feet and angered with the snort through his nose as his eyes were yellow with the flow of the darkness. With that his father came forward again striking out towards his son. The attack first came at his left shoulder then swung low at his right thigh. Then bringing his saber up he wanted to barrage Junior at his other shoulder. As his father, or who looked like him grit his teeth with every strike toward the younger Padawan. Junior then backed up another step and parried that attack that came first aside. Followed that with another parry pushing it away before he saw the attack to his right shoulder come. It was fast and hard with strength behind it as Junior came up to block it as the sabers sparked and hissed. It took all of Junior's strength to keep it from hitting him and he then started to fall to one knee. Gritting his own teeth he then yelled out as he let the Force flow through him. Utilizing speed he let it's energy flow through him and enhance his actions. The world around him slowing to a pace where he rolled back disengaging his blade as his father's energy blade hit the dirt. Rolling back to his feet Jacob ran toward him and stretched his hand out letting the Force flow from his hand, to defend himself again. The Force pushed against the elder Murano and sent him flying backward into the wall. Hitting with a thud, he couldn't tell now if it was his father or not. All seemed real enough to him. Keeping blue eyes locked on the dark one Junior then saw the other stumble to his feet and Jacob pushed him again. Stepping closer to him he kept a locked gaze on the apparition. "Not this time!" Junior said, "Give up." "Never! You'll give in just like me, it is your destiny..." His father, the apparition of said with a dark and sinister tone. "No, not anymore! My destiny is my own...I will succeed where he failed. Do what he did not. Learn what he failed to learn and be better because he'd want me to be. I am a Jedi, as my father before me...and his father, and so on and so forth. The legacy of my family being Jedi will not end with me!" Jacob shouted as he saw the apparition reach out with the Force and push him. Sending him flying backward and to the ground, he then bounced a bit onto the dirt and looked up at the apparition. It stumbled to it's feet before igniting it's blade again. He felt in his pocket for a second. Yes! The crystal was there safe still! Stumbling to his feet he then looked at the apparition as he then stood waiting for it's next move. Junior watched the apparition of his father carefully. As he was now on his feet along with it they locked eyes onto one another. Igniting his own blade he then stood ready to defend himself and circled toward the holocron. It in turn circled him and Junior kept himself between the apparition and the holocron. Thinking of the memories he'd had with his father and what his father once stood for he then felt this overwhelming sense of calm and inner peace. In that moment Junior finally got past his father, and now was his own man. Sure, he would do what his father failed to, and he learned from all the past mistakes his father did. The little boy that all of the Jedi knew was there no longer. Now stood a man on the brink of being a Knight. The Padawan was now at peace with what happened to his father, and he was now at peace with himself. Brimming with confidence he then stood firm toward the apparition as it then backed up to another opening inside the cave. For a moment it winked at him and backed up shutting it's blade off. Watching it go into the darkness he then canted his head at it and disengaged his blade. Now he only felt small amounts of the darkness but he then turned to look at the holocron. Which made him fetch the crystal out of his pocket. Once again his memories flooded him and he thought of the good moments in his life so far. Malissa, his training, making friends and watching his father teach and all that sort of stuff. A smile came to his face as he heard the clicking of something unlocking. Widening his eyes Jacob looked and saw that the holocron itself was now visible from it's mechanism that kept it safe. He then reached out to grab it and was flooded with the Force. The wave that went through him took him by surprise for a moment before he then grabbed it and then headed outside of the cave. With that and the crystal firmly in his hands he then stepped to the entrance. "I finally conquered it." Jacob said out loud, "I finally got over my father. I feel...at peace with it. No longer do I feel such hate for him. I am my own, and I will continue what he started. Be what he wasn't." Jedi Master Rendahl watched as the scene played out to its conclusion. She nodded and smiled as she approached the padawan. "Jedi Padawan Jacob Murano, Jr., you have passed the test and have freed yourself from that which had been holding you back. You are at peace with your past and can now move forward toward your future. I now bestow upon you the rank of Jedi Knight. May your newfound strength in the Light serve as a beacon of hope to all who have walked a similar path in the galaxy. Congratulations." Jacob saw Master Rendahl coming toward him and he then bowed as she then spoke to him. Breathing a sigh of relief he then found himself at peace once more as she bestowed upon him the rank of Knight. He had finally felt accomplished after all this time. From being a little Youngling those many years ago and finally achieving the rank of Jedi Knight he wished in this moment his father could see it. Though, in some way he figured his father could, wherever he was. With that being said he smiled with pride and accomplishment and realized that he had stepped from his father's shadow. "Thank you, Master. I will keep making stride for all." He said confidently, "My journey isn't complete, but I've made quite a stride to get here."